The Heavy Hitch Front Receiver Hitch John Deere sub-compact Tractors allows you to use a standard hitch or chain at the front of your tractor. Perfect for pulling and towing purposes when you need access to the front of the tractor. Receiver extends 5 1/2″ from the base of the mount. Be sure to check for fitment issues when using a front end loader. 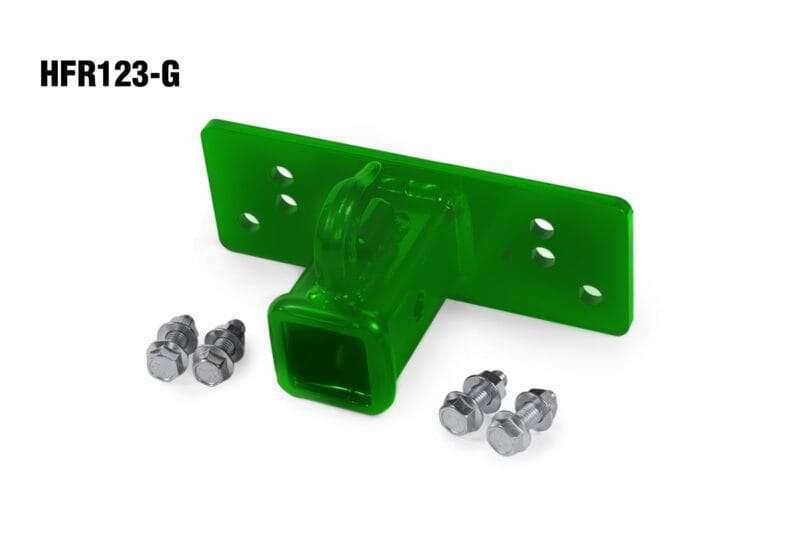 Compatible with John Deere 1, 2 and 3 series tractors such as the 1023E, 1025R, 1026R, 2025R, 2032R, 2038R, 3025E, 3032E, 3033R, 3038R, 3039R and 3046R sub-compact tractors. Direct bolt-on using existing holes in front frame. Includes 3/8″ welded on chain hook. PERFECT! Was looking for a convenient way to relocate my fishing boat and cargo trailers. The front end hitch is very well constructed and bolted on to the front of my John Deere 1025R in a matter of minutes. Fast shipping as well. Highly recommend! Received the front hitch reciever for my JD 1025R in three days and bolted it on in about five minutes. There is no interference with the front end loader and it looks great. Incerted a hitch in the reciever and easily moved my boat into my shop for winter storage much easier than I could with my truck. The first move proved the receivers value and usefulness.